So, who is this ordinary looking woman anyway? My name is Brenda Kendall and I guess you could call me a transplanted Kiwi (New Zealander) now (2005) living in Gunnedah, New South Wales. 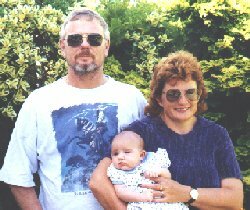 My husband Ian was made redundant June 1995 in New Zealand but found work in OZ, and then overseas in the oil industry, and we moved to Perth, Western Australia. Then in April 2004 he was again made redundant and this time we have made a complete new change to our lives and have purchased a motel business. On Australia Day 1998 (26 January) I celebrated by taking my pledge for Australian Citizenship. So now I am a Kiwi and an Aussie. Ian took his pledge 11th January 2001. Until Monday 23rd August 1999 I had a Pentium PII 350 but we unfortunately had a fire in the study (thank goodness for smoke alarms) and the puter was completely destroyed along with my new Epson Photo 1200 printer. The smoke damage to the rest of the house was horrific but the insurance company jumped in straight away by removing everything for cleaning. We did lose some of our backups unfortunately as the disks got wet when Ian put the fire out. In 2002 I now have a flash Pentium 4 with 1.9 gig ram and two 60 gig hard drives. I also have a CD burner and DVD burner and do different backups every night in the hope that I won't lose data in the future if I have another puter crash. Since moving to Australia I have worked as an office temp working as receptionist, accounts clerk or general office clerk. Then I got a casual position working in the office at a Nursing Home in Ferndale, Perth. I learnt a lot with working with MS Word while there and picked up lots of information in general that has stood me in good stead with working in our new office at the motel. About 14 years ago I was talking to a friend who was telling me all about the local Genealogy club and how she was tracing her family tree. Now I had been slowly doing this since I was about 13 so I questioned her further. The upshot being that I went along to the next club meeting. It wasn't very long before I discovered that Genealogy and computers could have been made for each other. So started a very time consuming hobby combining two loves. One of the things that we were sad about when it came to leaving New Zealand was that we had to leave our six cats behind with new families. We have since heard from some of them and they are doing well. Our first Australian cat is Ragtail Genghis Khan and he is a Ragdoll cat. We first saw him when he was only 3 days old in August 1996 then not long after we also got Majesticoon Big Biscuit, a cream point Birman. So much for saying we would only have 2 cats. We now also have Dayglo a semi-longhair classic red tabby and Ebony who retired from breeding in May 2001 and is Genghis' mum.